It's drizzling lightly as I walk to the river. The birds herald the coming of the wet, however thin the water feels. With shrieks and cries the parrots, lorikeets and noisy miners welcome the faint memory of downpour. A whip bird cracks the morning air. The ravens sit in the treetops above the river and signal the dimming of the full mooon. As I wake the moon is full, round, luminous but as the darkness ebbs into the day, the sky greys over and the light glows bright almost yellow on the trees. It has been raining this week and the rain and grey skies often bring such a golden radiance and glowing light. This morning there are alot of people about, walking their dogs, chatting about the river and how much they enjoy the time they spend here. But not everthing is peaceful. One of the local residents tells me how she has rescued a number of injured flying foxes caught up in the barbed wire at the edge of the track. 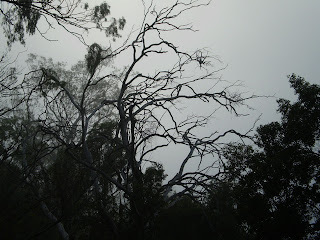 One day, not long after I moved here, I had seen a flying fox stuck, imprinted onto the wire, I thought it was dead. But I was wrong. The rivercarer described how the bat had looked at her, imploring for help and she hurried home to phone the local wildlife rescue service and they took care of the injured animal. It made me realise I need to be more aware, to listen to the riverplace, to feel the land, to hear the cry of others. This morning the rivercarer told me she had rescued another fruit bat caught up in the wire. She said the sight was so distressing that the other people who witnessed the rescue are now trying to lobby for the barbed wire to be removed. At dusk the fying foxes fly up from the river valley and spread through the sky in search of nectar and fruit. I feel grateful that these beautiful creatures have someone who cares for them.